I woke up at 9 AM and got up at 10:00. By 10:30 I was on my run to the wharf and it was a beautiful day. 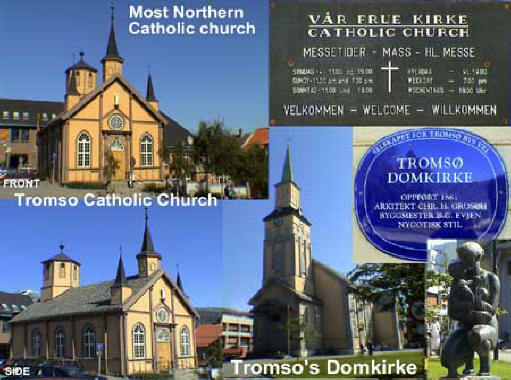 On the way back I stopped at the Tromsø Catholic church [Storgata 94] (below) which claims to be the farthest north active Roman Catholic Church in the world. It would have been nice if I could have made up Sunday's missed Mass but it was Tuesday, so it was closed and I couldn’t even see the inside. 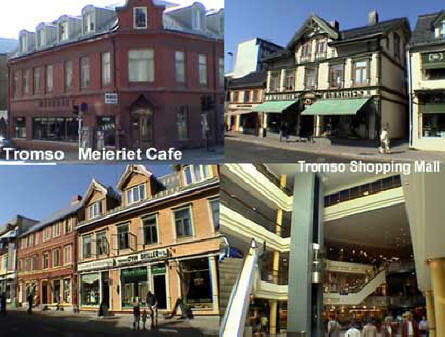 I enjoyed it very much walking through the streets of this “Paris of the North” as it is called. 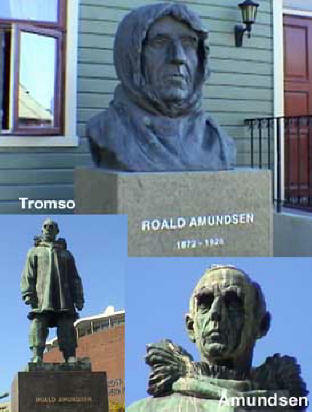 It was very quaint: I saw many statues of Roald Amundsen (1872-1928) (left) who was the first to cross the North West Passage in 1905 and was the first to reach the South Pole in 1911. He won the famous race with Robert Scott (Scott's entire party died) to reach the Pole first. 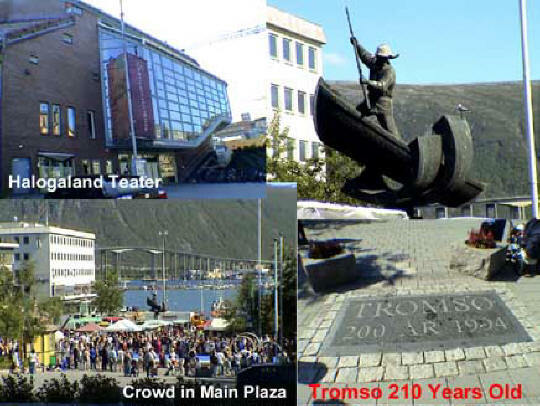 All his expeditions started from here in Tromsø. I went down by the wharf near the restaurant we ate last night and went through their shopping center which was quite modern. 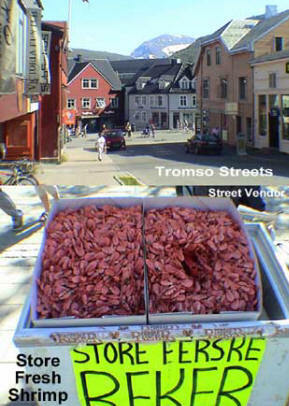 There was a vendor selling fresh shrimp (below left) from a Styrofoam box. I was almost tempted to buy some, but where would I cook them? 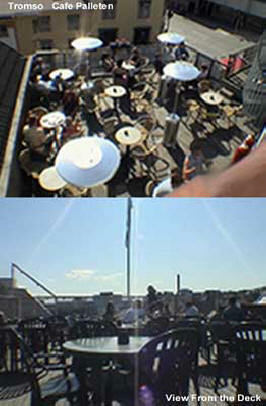 I meandered around and at 11:15 I found a nice place for a cappuccino called Kaffe Bønna [, +47-.] It was inside and I worked on some video pictures. The waitress was very nice and when I asked if I could buy one of their cups as a souvenir, she gave it to me. At noon I walked back and kept exploring the town passing all the crowds out for a beautiful day. It was very festive. At 2:30 I stopped for a coke and another cappuccino at Café Palleten [, +47-] (below left) which was difficult to find the entrance to. I went straight to the upstairs veranda with a view of the city and worked on photos. I walked back to the room at 4:30 and we packed up and checked out of the hotel, again using my ScanPass card. 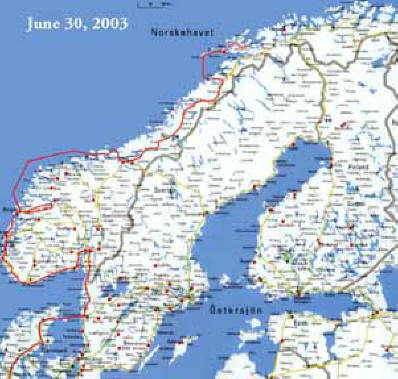 I had looked at the map previously and the drive from Tromsø to Nordkapp looked like a tortuous coast road that would take forever, with scenery that would be the same as from a boat. If it had been a straighter inland route, driving might have been more scenic and quicker. So I called and tried to book another Hurtigrutin ship to take us to the closest we could get to Nordkapp which was the little port town of Honningsvåg. The fare was $490 for the two of us plus the car, but at least we would get a reprieve from driving and a place to sleep. 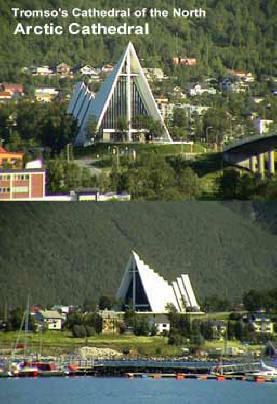 I also had tried to book a room in Honningsvåg or Nordkapp but was told it was impossible. 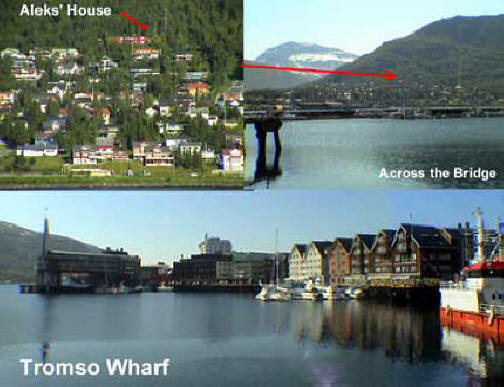 I finally got a room in a B&B 9 miles north of Honningsvåg right on the water. We could only hope for the best.